Knowing full well they may die in the attempt, a small band of monks sets out to convert the savage Danes who have laid waste to the surrounding countryside year after year. The monks’ faith is sorely tested as they face opposition from the angry Priest of Odin as well as doubts, sickness and starvation, but their leader, Osric, is unwavering in his attempts to share the “White Christ” with those who reject Him. Then the monks discover a young Christian woman who has escaped being sacrificed to the Danish gods—can she help reach those who had enslaved her and tried to kill her? 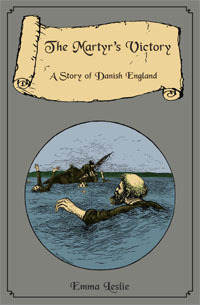 Story Setting: Danish England in 879 - 883 A.D.
"We just read The Martyr's Victory and we loved it. It truly challenged our faith as a family. Thank you for publishing great reading material for the whole family." ~ Patricia L.